What​ the hell is​ happening​ to​ the​ Lightning? That’s​ the​ big question​ in the NHL​ these days, and​ honestly,​ I have no​​ idea. None. I know there are easy narratives we can grasp at – They’re not built for playoff hockey! They don’t want it bad enough! They haven’t had to face enough adversity! – but I think we all realize on some level that it’s nonsense. Teams that rack up 62 wins don’t suddenly become fatally flawed in the playoffs. Except that yeah, the Lightning sure seem flawed. A month ago I wrote about pretty much this exact scenario, where the Lightning suffer through a shocking exit and we all race to slap an explanation on it. But even then, I was working under the assumption that a Lightning upset would feel like, well, an upset. That they’d run into a hot goalie or have a bunch of bad bounces or whatever. That’s not what’s happening. They’re getting their butts kicked. The Blue Jackets have been the better team since the first period of Game 1. This is some history-making madness. So yeah, I’m as lost as you are. But the reality is that there’s a good chance that the series ends tonight, and the Lightning season will end without so much as a playoff win to their name. And they may not be alone – the 100-point Penguins are also staring down a sweep tonight. Those are two pretty good teams, and they might combine for zero wins in the postseason. That’s hard to explain. But it’s not unprecedented. So today, let’s try to make Lightning fans feel better – or let’s face it, probably worse – by looking back at eight of the best regular season teams in NHL history who didn’t win a single playoff game. The regular season: Under rookie head coach Darryl Sutter, the Hawks had one of the best regular seasons in franchise history. They finished the year with a record of 47-25-12, good for a conference-best 106 points that set up a first-round meeting with the 85-point Blues. Easy, right? The disaster: Curtis Joseph has a weird tendency to show up in these stories. This one was the 24-year-old’s first time performing what would become his trademark move for the rest of the ’90s: pretty much single-handedly winning a playoff series. After making 24 saves in a 4-3 win in Game 1, Joseph went on to shut out the Hawks in back-to-back games, making 81 saves in the process. That pushed the Hawks to the brink, and while Chicago would find the net again in Game 4, the Blues finished the job in overtime. That goal came with a bit of controversy, and an appropriately heated Ed Belfour meltdown. The epilogue: This was the second stunning first-round exit in three years by the Hawks; they’d lost to the North Stars in six games in 1991. They’d followed that with a trip to the final in 1992, but there was no similar rebound here. The Hawks would win just three more rounds in 15 seasons until reemerging as Cup contenders in the Jonathan Toews/Patrick Kane era. The regular season: By 1981, the Habs dynasty of the late-70s was essentially over. 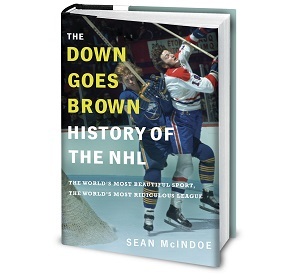 For the first time in five years, they hadn’t won the Cup in 1980, and key pieces like Scotty Bowman, Jacques Lemaire and Ken Dryden were gone. But they still had guys like Guy Lafleur, Larry Robinson and Steve Shutt on a roster that featured seven Hall of Famers, and they rolled to a conference-best 103 points. That earned them an easy first-round matchup against a 74-point team that had never won a playoff game. The disaster: That first-round opponent was the Edmonton Oilers, and they turned out to have a few Hall of Famers of their own. Even though they’d only won 29 of their 80 games during the season, the Oilers stunned the Canadiens by pumping home 15 goals in a three-game preliminary round sweep. The epilogue: Those early-80s best-of-five openers were tricky – they also saw sweeps of 100-point teams like the 1982-83 Flyers, 1983-84 Sabres and 1983-84 Bruins. As for the Canadiens, they finished first again in 1981-82, only to suffer yet another first-round upset, this time to the Nordiques in five. Montreal wouldn’t win another playoff round until Steve Penney showed up in 1984, and some other rookie goalie who arrived a year later helped them get back to winning Cups. And those upstart Oilers went on to win a few of their own.